Huawei signed an MOU with Ain Shams University to establish information and network training academy. The students of the faculty of engineering, Ain Shams University soon will be able to understand and use the latest technologies in the field of information and network. Leading Chinese networking and telecommunications devices manufacturer Huawei signed a Memorandum of Understanding with Ain Shams University to ensure this. Huawei will establish the Huawei Authorized Information and Network Academy HAINA and will supply it with the latest equipment of its own products. Huawei will also offer certification for the training program and prepare 2 graduates of the academy to be able to instruct other trainees. The MOU was signed by the Dean of the Faculty of Engineering, Ain Shams University Ayman Ashour and Denny Leo Head of information technology solutions in Huawei Egypt. A delegation of the university of South China headed by Professor Lee Meng. Ashour praised the initiative by Huawei that will produce a generation that understands modern technologies, while Leo stated that Huawei’s aim is to provide labor power with the training and education needed in the market. 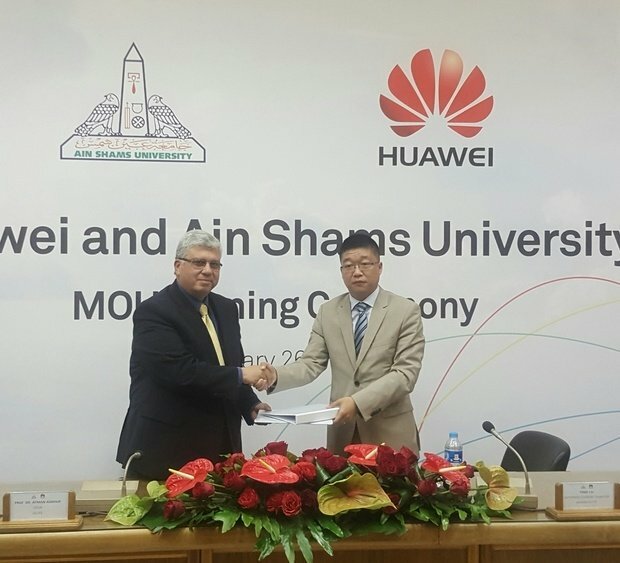 The MOU is the first step in a long-term cooperation between Huawei and Ain Shams university.